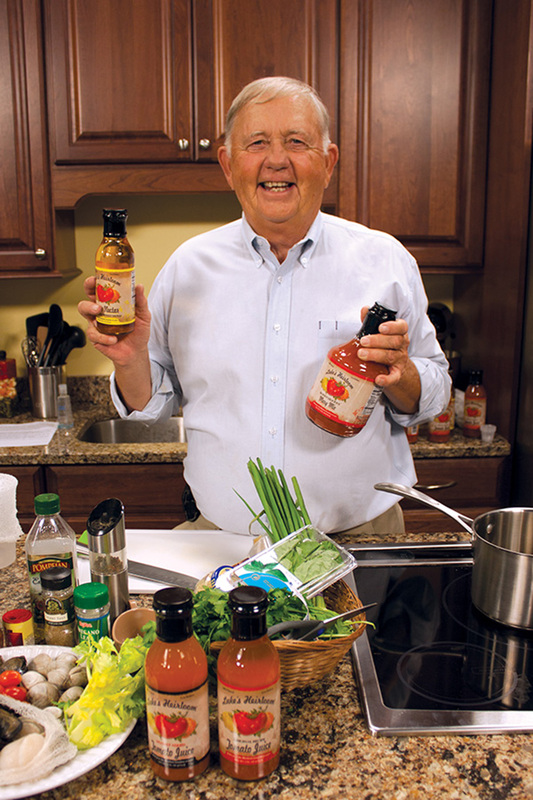 Jim Hudson Didn’t Invent Tomato Juice, He Just Perfected It! Who doesn’t like a delicious ripened tomato grown in your own backyard? Sounds good, and there are so many ways to enjoy these summertime treats. Perhaps you’d like to slice it up and place it between two warm slices of toast with a little bit of mayo? A classic Eastern Shore ‘mater sammich.’ This is how self proclaimed ‘tomato nut’ Jim Hudson most enjoys a delicious ripe tomato. It would be wise to trust his seasoned tomato taste, as owner of Luke’s Premier Foods his company is the only one to produce tomato juice not from concentrate. He is also the only producer of a clear tomato juice which he calls ‘Tomato Nectar.’ “Not only does it taste great as a drink, it’s also great for cooking because you get all the flavor of a ripened tomato without the pasty consistency,” says Jim. On top of all that Luke’s Premier Foods uses only locally grown heirloom tomatoes grown right here on the Eastern Shore of Maryland! We here at the Harrison Group & ocmdhotels take great pride with our welcoming hotels and restaurants that offer great food with unique dining experiences. We use Jim’s delicious homegrown juices at our restaurants to bring flavor to our dishes that is unique to Ocean City, MD. When dining in our restaurants you truly are experiencing the Eastern Shore, along with all it’s flavors, and we are proud to have Jim be part of that.